Seattle-based globetrotter Carol Willison recently travelled with Uzbek Journeys to Kyrgyzstan and Uzbekistan. 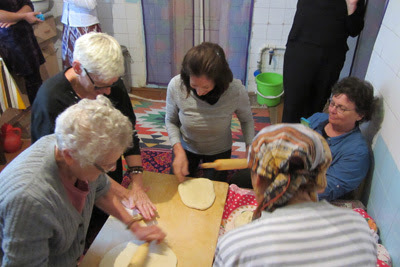 With fellow travellers, she participated in a bread making master class in Khiva, arranged as an optional activity on the tour. This is her story about the class. It is still dark when five of us, flashlights and bread stamps in hand, slip out of our hotel and wind our way through the narrow streets of Khiva. We are on our way to make bread. We arrive at the guest house, remove our shoes and move quietly into the small, warm, cosy kitchen. Our host, Zulkhumor, does not speak English, but her son, Jaloladdin, is there to translate. First a plastic cloth is laid out on the floor and a large pile of flour and other ingredients added. It seems like a huge amount, but then I realize she is making bread for a few days, for those staying in the guest house and for our group's dinner tonight. 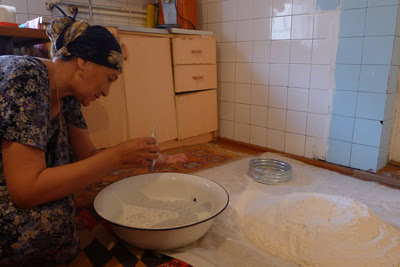 After she mixes the dough and kneads it, it is put into a very large bowl and gently wrapped in quilts and put to rest. 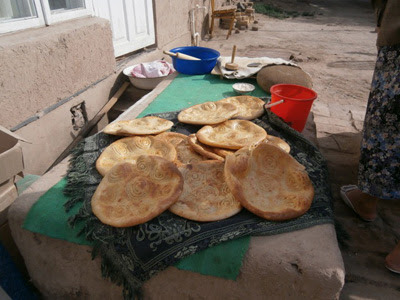 Then, per Uzbek hospitality, we have to sit down and eat. Of course we are served tea, and also jam, bread, and honey - then we head back to our own hotel (for breakfast! ), scheduled to return in another hour or so after the dough has risen. Back we go, this time it is light and we all slide into the kitchen where we break off chunks of the dough and begin kneading it and making small balls. These all go back in the large bowl to rise again. The kitchen is small and the oven is tiny, where are we going to bake the bread? At this point, Jaloladdin starts to make a fire outside in the tandyr oven. Since nothing goes to waste in Uzbekistan, he hauls down bundles of dried cotton plant stalks to fuel the fire. 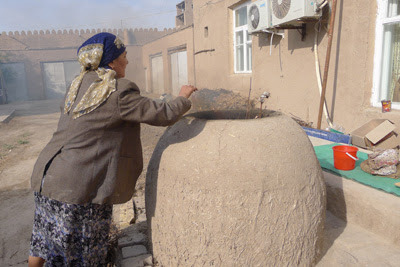 The oven, made of mud, straw and bricks, is a dome-shaped structure with a round hole in the top. It will last up to 4-5 years. We realize that the key is getting the temperature of the fire just right. We now take the balls out of the bowl and flatten them out into the size of medium size pizzas, then the stamping begins. Stamping the dough is also critical: not too light, not too heavy. Zulkhumor then works quickly with a large hand mitt to slap the bread against the sides of the tandyr oven walls. Our first few circles of bread are slightly burnt because the oven is really hot. Then the next batch is perfect. They come out golden brown and hot - of course we have to eat them. Family members bring out butter and honey and we are eating for the third time in the space of 3 hours! We are laughing and somehow communicating with a group of women who do not share a common language, except that of being together and producing food for others. This is an experience that cannot be found by just moving from one historic landmark to the next or by visiting museums. These are the women of this household, who are sharing their craft and culture with us. We are sent back to the hotel with a few hot loaves, knowing that the rest of our group will be eating the bread we made at dinner tonight. Here is our bread, straight from the tandyr!